I have been thinking about the new things that will be appearing in Fable III and how its going to relate to what has happened before in Fable II. The first thing that came to mind is all the odd little side-quests that we undertook in Fable II. The picture just to the left is of 'Son of Chesty' the trophy you are awarded along with the shard of his heart when you complete his little mind bending quest. 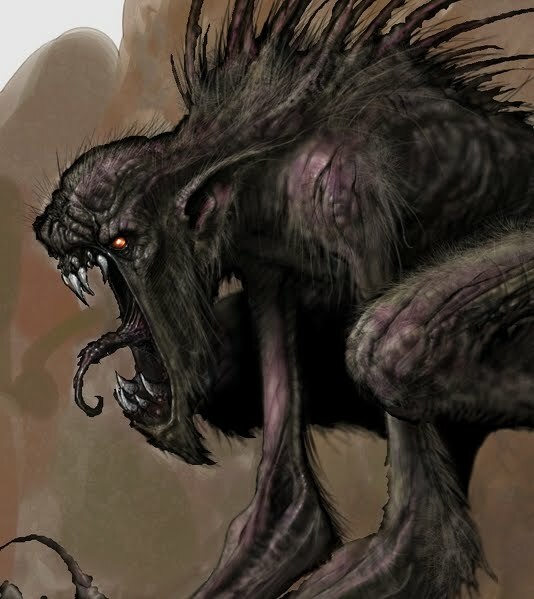 Well, in that way I was thinking how awesome it would be for there to be more of this kind of thing in Fable III. We all love a good puzzle and a good fright, and Chesty was more than able to make things go with a scary bang. Pitting us against our wits as well as our enemies. And all by reducing you to a small and doomed child wandering in a nightmare world. If the Son of the Son of Chesty should make an appearance, ready for vengeance and wanting to make you his super best friend again, then I will be one happy bard. As well as this there is the spooky Terry Cotter's army that dwells within one of the demon doors. We want to see more of the freaky suits of armour and the darker side of life in the world of Albion, bring them back Lionhead! Finally but not without merit is the 'down the rabbit hole' quest we saw in the DLC for Fable II. 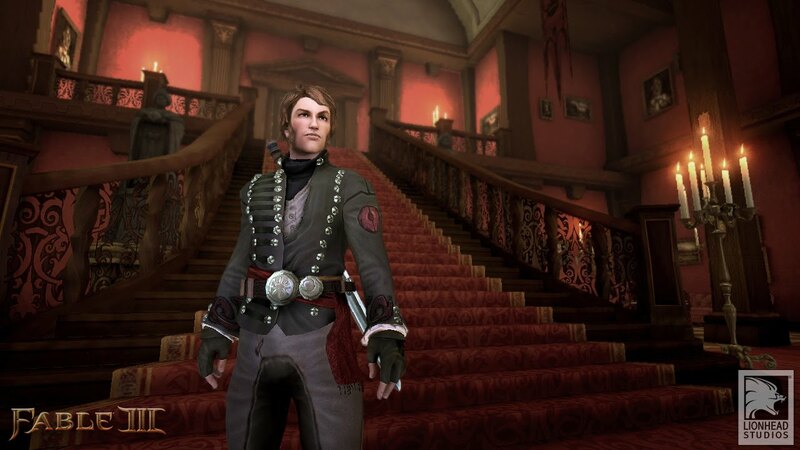 Was utterly amazing to have that little bit of oddity in there, and this is what Fable II and Lionhead does best. Was doing some late night checking and looking around for information. 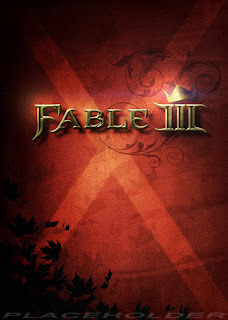 And while I was doing so I came across this interesting little image on the Facebook Fable III site. Looks pretty ace to me, new logo with the crown and the original artwork on the background from when the game was revealed. Its certainly a very evocative image and will certainly be spurring on some new box art I bet from people in the community. Will keep an eye out for any good ones, and heck might even go and make one myself. There are three different slogans. Mine says 'Work Harder, Not Smarter'. I can't remember the third, I think it's something like 'small hands means less broken fingers'"
...was the response. Looks like the Development team are being whipped into shape, would be great if they had Stephen Fry's voice being piped in over the intercom system with similar phrases. Really would be 'method video game development'. So I was thinking after we have had a little discussion about the lovely tipples for the adventurer, be that wine or beer, we have come out with a clear winner in favour of the golden ale! Seems about right, although all those who favoured the more high cultured drink were also up in arms. 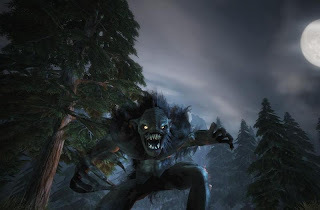 So, being one of a bardic mind and always searching for a good reason to go and round up pals for a bar crawl or two with bawdy songs and drinking games about dragons and hobbes, I decided to do a little late night blogging and reveal my favourite bars in Albion. This first tavern is located in the rainy old province of Rookridge. Sadly it was in a bit of a state of disrepair when your hero first makes an appearance there, being home to Dash and his bandits of course. But, with a little bit of a spruce up and getting rid of the bandits infesting the area, it becomes a nice little place for a drink. For the well intentioned it is also a place later in the game to deal with the 'Something Rotten' quest which is something of a surprise for those who go unprepared! For the more...well...shadowy...customer it is also a good place to get the patrons drunk and lead them off to that temple of shadows situated just at the top of the hill. Either way, with a spectacular view out over the bay and when all is dealt with a fine and well to do pub interior, can't say no when sitting down to a good beer in there. My second on the list is for its rather questionable atmosphere of course. When a bard needs something done he doesn't turn to the law, but the dark underbelly of society, well...ok, the pirates with one leg and very little of their mind left. To be a fan of this pub needs little explanation. Located in Bloodstone, surrounded by ruffians and sea dogs you can get away with a fight here, shoot the vagabond who keeps kicking your dog, get drunk and not get kicked out of town and even jump around the tavern like something out of Tortuga. Plus, with the pirates treasure quest waiting in there for you, its the perfect place to go and enjoy yourself when you fancy a little bit of the wild side. Thankfully however for the more careful individual there is always the boat on the harbour to take you back to the nice and relaxed Westcliff if you please. Thats just two for now, and will certainly be talking about more in the future. Right now, going to go and get my beer from The Bloody Stump (I will go into much greater detail with this one day, just you wait), sit down with a pipe and my dog Felix and watch the townspeople go by on their way home from a late nights drinking. 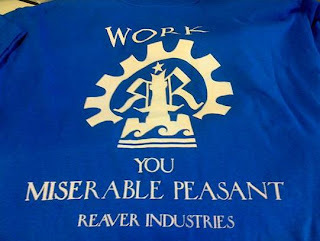 So been spying into the twitter-verse again and found this little tshirt that I assume the Lionhead team have been wearing these past few weeks. Heck this could also be some of the first bits of merchandise that we could be getting from Lionhead in the run up to the release of Fable III at the end of the year. Looks pretty flash and shows that Reaver is going to be taking a whole lot more of a role in the next game than just a mere side role. Not a bad thing to have a lot more Stephen Fry in the game methinks. Some things of note are the Spire in the middle of the image. Maybe the Spire has been taken over by the undying lady (and men's) man and we should be looking to see where poor Theresa has ended up! Also the gear is pretty much a sign of industry, maybe Reaver has been putting some colonial peoples into a bit of a workforce like something out of Mr Dicken's novels. 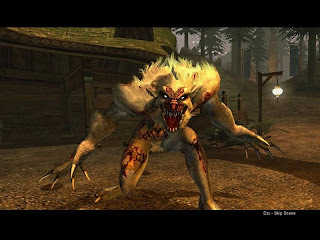 Since the last poll has done so well again going to be doing a little featurette on my favourite pubs from Fable and Fable II. Watch this space people. 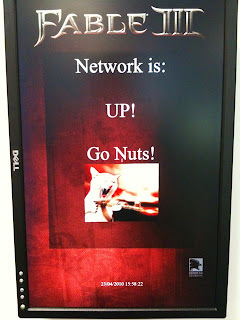 Thought I would add a new blogpost since there has been some nice twittering from the Lionhead team. This is the first and possibly best news for you guys (see left) as that certainly means that things are progressing well. It all good news and that's the best kind of news. And a note from the team, there won't be any cats with machines guns just to make things clear. 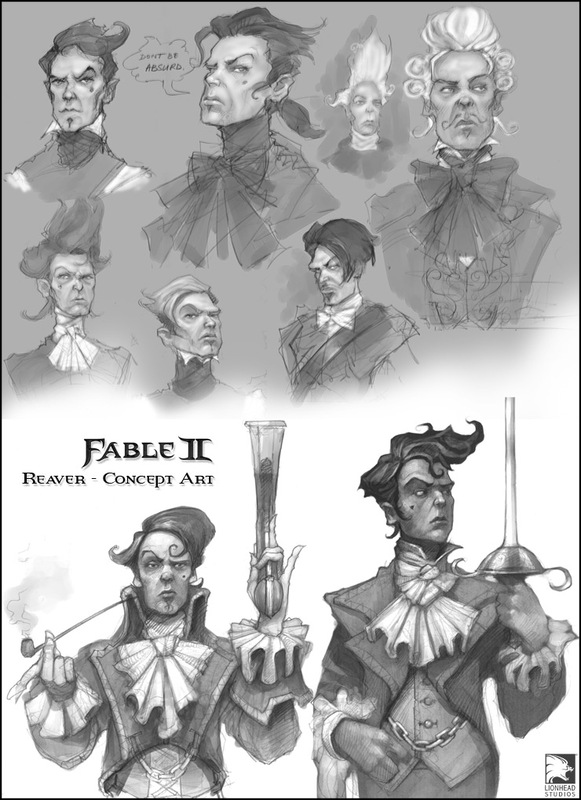 I'm personally hoping for a lot more concept art from the guys at Lionhead, and especially my favourite artist from their team Matt Allsopp. And now some calm pictures to help you through the last few hours of this Friday. 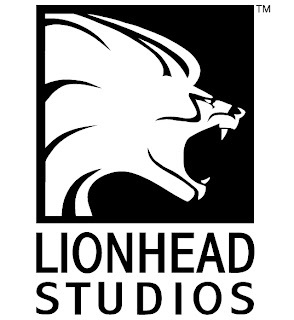 They are from the offices of the Lionhead team, and they are situated around a fantastic lake that you always see at the start of the Video Diaries the team creates. Talking of Video diaries, from what I can gather the next one is not too far away so you should keep an eye on the community page for more updates and then finally the video itself. Also included are some pictures from the Lionhead BBQ session happening today. Roasting meat just like that damnable dragon did until St George came and slew him. Nice little aside there, St George killed the last dragon, so did the Jack Slayer in Fable. 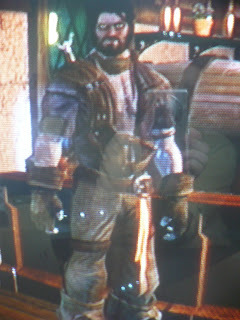 Ah the Fable II hero. Well, since my entire roster of Fable II heroes and heroines was wiped for some reason. Damn you 360. I have had to start all over again, and make my definitive hero for the upcoming release of Fable III. 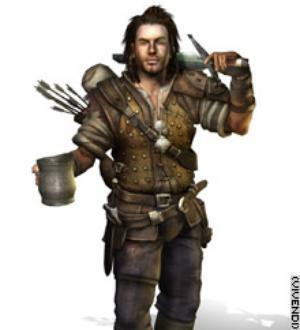 And here he is, Bard, or Blade as he is known in the game. I always try and set out to make a believable hero, that could be at home in the world of Albion. And hopefully with Blade I have done just that. From the looks of him, I have dabbled a little in magic, mainly only confusion spells and the odd bit of slowtime to help things along. He is corrupt in his ways, hence the yellow eyes but he is still pure of action. He just likes the girls and the beer a little too much, and of course all the money. There's a close up of his face, showing off the beard, a few scars and whatnot about his face. He is a pretty burly fighter but he does a lot more drinking than he does saving people from balverines. Also its making it a bit more challenging using the steel longsword all the way through, but I like that. Will have more from him as the game progresses and will let you know what he looks like when he is King of Albion! Everyone loves the Fable series for its music. Some of the best scores ever written for a video game. Well, with Fable III this will surely continue, but how is the music going to play out? Here are a few suggestions from my mere mortal self. 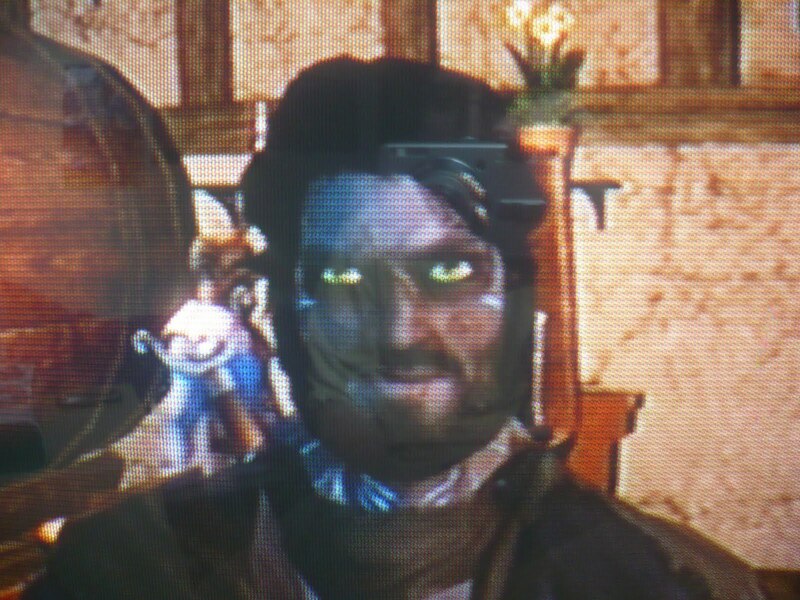 First off, everyone loves Bards. 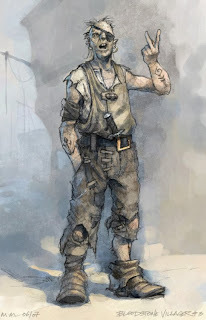 In a previous post way back when I began this blog I talked about the needs for Bards to play a better role in the game. Playable songs, usable songs, and just plain funny songs for the tavern. I mean, look they even went as far as 'nearly' putting Bards in World of Warcraft (See picture above) so its got to be on every ones wish list! Secondly, love the classical epicness of the last two soundtracks. But, with the new age and the new power of steam and iron maybe this will effect the music? Would love to hear the sounds of industry slinking through the classical tones, adding that extra bit of awkward change to the melody and creating an all together different ambience within the game, especially when you will then transition from natural surroundings to the bustling city. 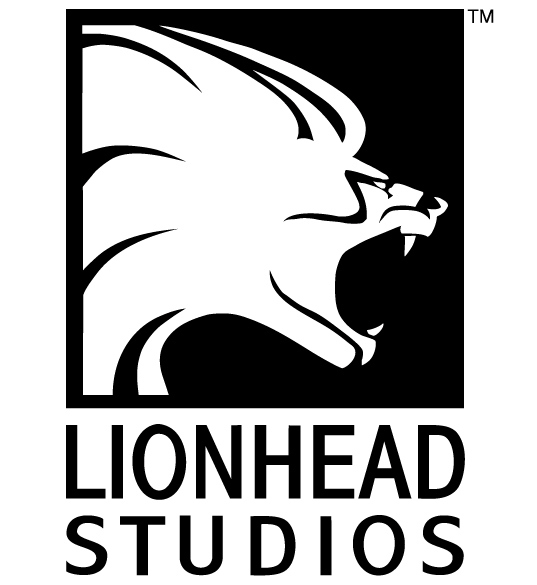 Go and join in the discussion on music at the Lionhead Forums...and as always, comment, follow and vote on the blogspot itself. Enjoy your evening, and lets hope the Ash cloud moves and doesn't stop work on Lionhead's baby too much longer. So after that small but inviting scan, how about a nice big HD screenshot of the hero for all of you lovely guys and gals? Sound about right? So here it is, and you can see that its looking pretty snazzy. The awesome paintings in the background from previous games are still there showing off some of the concept art. Got some nice close ups of his uniform as well which seems to have a 'done up' and 'undone' look about that jacket of his. Some nice muttonchops and 'untidy' hair make a return it seems so that's fabulous. The new semi-real feel of the characters and world is feeling pretty ace as well, love the way the graphics look and its finally looking like a Next-Gen game on the 360. Lets hope for more soon. So I buckled and did some scanning. Here you go. If I get told off for this then I will have to take them down, but I just thought its been out a while now so there can't be much harm. Can it? I will be growing Horns for this decision methinks. Hope you guys enjoy the new screenshots and the concept art/renders as well. The horns are growing I can feel it. The forum is awash with post after post about what we have seen, but nothing about what is 'happening' in the studio. So, Monbee has stepped in to fill us in on the day to day workings of the studio and how it all works in the big boys world of video game development. So...without further ado here is the lovely link to that fantastic information. Check it out, its a seriously good read. So many of you may remember two things from Fable. The first is the ending credits of not only the first game, but the second. 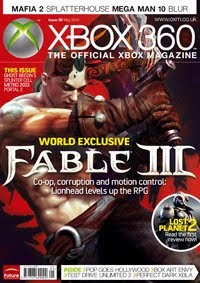 If you remember they had a section which was devoted to the mass of extra things that happened during the development of Fable. Well, after looking through twitter I found a few little morsels. The first is this tweet my Sam as they work late into the office hours. 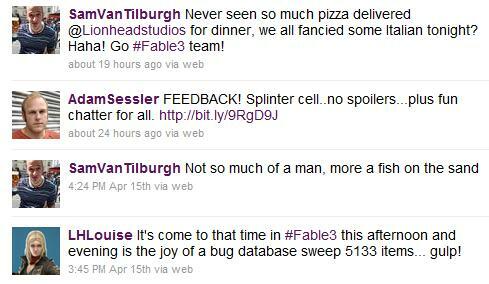 As you can see the whole of the Lionhead team is indeed keeping up their record with more and more pizza. 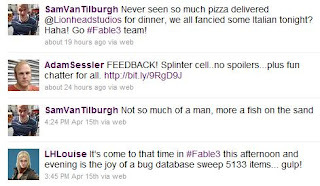 The second is the lovely amount of bugs being fought in the studio it seems. 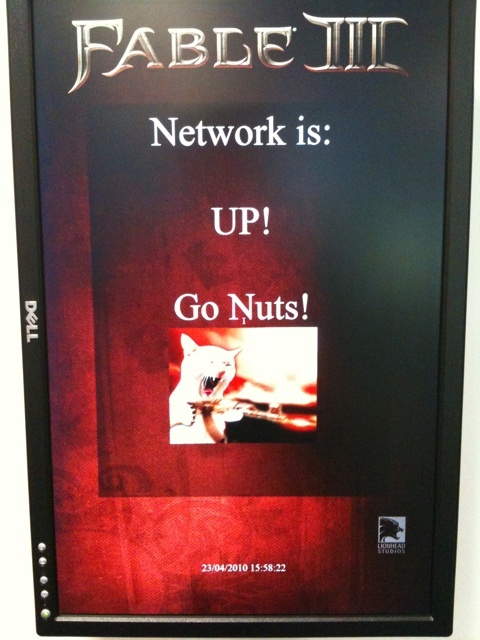 Well, keep to it Lionhead. We are all behind you. And tell us more about your ordering habits! 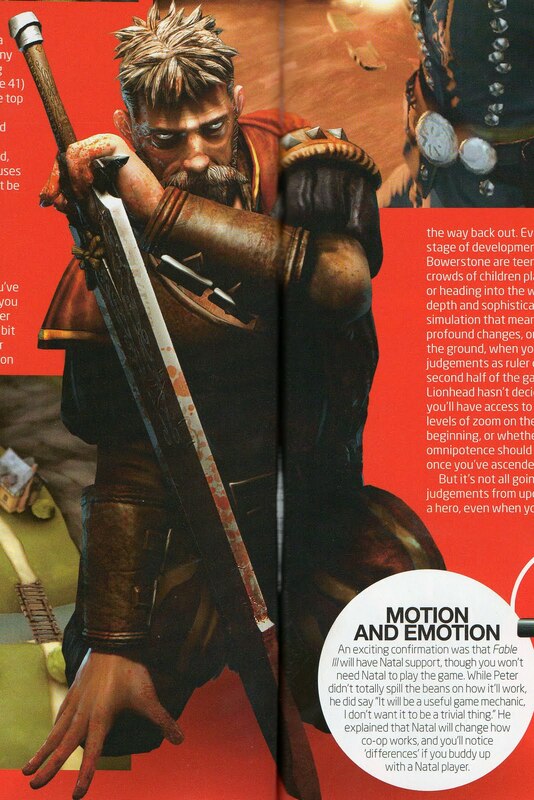 So been looking through my copy of OXM UK and there's some fantastic new stuff in there. I won't be scanning the pages in, but can talk about some of the new interesting stuff that comes from the magazine and the interviews that they had. One of the biggest things from the article is the co-operative that is coming to the game. In Fable II they had the ORBS system as well as the ability to play online with a henchman version of your character from your own game. Well, Lionhead has listened to all the information from their fans and they are totally recreating the co-op experience. The ORBS system is back, although now your friends will appear on your massive map as well as wandering around your world with you. You can interact with them the same, trading and such like but now when you wish to co-op with your buddies they appear in your world not as a non-entity henchman but as their own character, complete with all their upgrades and everything in tow. As well as this you are no longer limited to the same screen. Your buddy can now go off and cause havoc on completely the other side of Albion, or indeed Aurora. Something else which is completely new is that for the first time, a relationship within a game can fully be between two heroes. You no longer have to be the King with his NPC Queen, you and your co-op partner can rule together, as full online King and Queen of Albion. Pretty interesting stuff when it comes to those important Judgements. 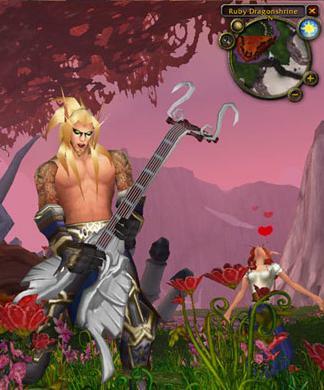 At last WoW players can 'marry' for real. The War Room as Peter has called it is still looking fantastic and OXM on their visit managed to see a good chunk of it, with people milling around the little world and going about their business. Combat is also going well it seems. From the GDC Demo we saw it looked fantastic, but the combat is more akin to DMC or Bayonetta apparently now than Fable's staple style. You can even preform juggling attacks with your pistol if you see fit it seems. As well as this finishers (those slow motion kills we saw in the demo) are unlocked as you progress for some fantastically bloody endings. Sounds like its going to be fantastic...go and check out your local vendor of news for a copy of the magazine, has some more details in there I didn't have time to type out. Looks pretty snazzy close up, click to make it bigger of course. Will be updating with a few link dumps tomorrow since its a nice relaxed Sunday. Watch this space. So head down to your local stockist and ask for the new OXM UK, and if you are from overseas then head online to order it to your country. Hopefully we will see some proper pictures from the article online once the magazine has been out for a bit. The embargo on the pictures must have been until the release of OXM, so...watch this space. Been a bit slow of late, but have finally got some news. 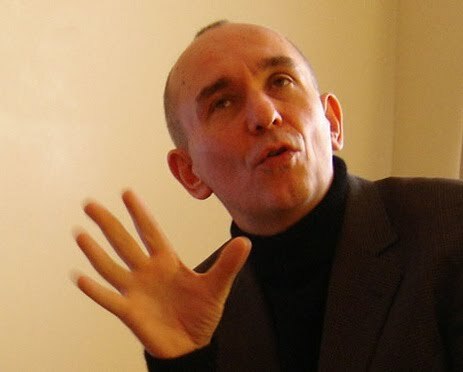 TIME magazine are going through their '100' most influential people of 2010 and our very own Peter Molyneux is in there and rocking the charts! While they have said that, as of the moment, Lady Gaga is the top person...that will surely change. He is beating Bill Clinton so far, so lets rock it out some more and get him even higher. Thank all for Peter, click the link below for the site and where to vote.